Image caption MP Conor Burns says the rules for overseas students are "ridiculous"
The coalition government has promised a Bournemouth MP that a review will be held into controls on language schools. 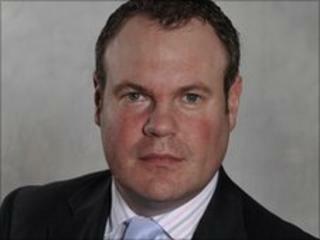 Conor Burns, the Conservative MP for Bournemouth West, raised the issue in the Commons to call for more support. He said overseas students are deterred from studying by a "ridiculous" requirement to already speak English before they are allowed a visa. New measures, the work of the previous government, were introduced in March to help deter bogus applications. Mr Burns said: "I want to go back to where we were before, where English schools can do what they were set up to do - to teach foreign students English. "It just seems to me incredible that the last government introduced rules which means people have to be GCSE-equivalent competent before they can come to Britain to learn it. "It is painfully, painfully ridiculous." Mr Burns said the rules were affecting the local economy of Bournemouth and Poole, which has one of the highest number of English language schools in the country. He said: "Students will need to brush up their English in their own country and bypass language schools, or choose another destination. "This is exactly what we're finding, students aren't coming to the UK any more - they're going to other countries." Guido Schillig, whose family has been running an Anglo-continental language school in Bournemouth for 60 years, said he would normally expect 3,000 students a year but the figure is down by 750.